It was a wonderful and memorable occasion when Afua Sam of Studio D’Maxsi Fashion Design house received the award for the ‘Fashion Designer of the Year’ at the recently concluded 2nd Annual African Awards USA which took place at the Georgia Public Broadcasting Studio, Atlanta, Georgia on August 31, 2013. Founded by Ghanaian born Afua Sam, Studio D’Maxsi, is one of the fastest growing fashion houses based in DC, creating masterpieces for the chic, bold and funky modern woman. Afua Sam proudly represented her humble Ghanaian roots and gave a moving inspirational speech as she received the award. Studio D’Maxsi has featured in various major fashion shows and won various other awards including ‘African Women In The Arts’ Couture Fashion Designer , ‘Excellence In The Fashion Industry’ Award By 3G Magazine, Top 10 Designers To Watch In The Metro Area by Council Magazine and also nominated two times in a row for ‘Fashion Award MD For High Fashion’ in 2012 and 2013. Others include - Fest Africa Honoree Award 2012 , Trendy Africa Magazine Honoree Awards 2013, ‘Africa Fashion Week New York 2012 and featuring in the DELTA SIGMA 100 years celebration among others. She was also recently recognized by Maryland Senator Barbara Mikulski. 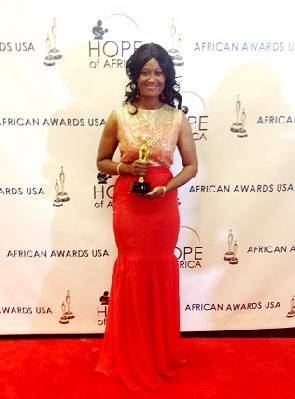 Afua Sam would like to thank God for His grace and mercy, the African Awards USA team, fans, growing clientele, media, friends and family who have kept her grounded thus far, for their support and patronage.